Exploring the depths of our many oceans has always been a fascinating topic for filmmakers, and over the years we’ve gotten some classic examples of underwater chaos like Das Boot, Crimson Tide and 20,000 Leagues Under The Sea. 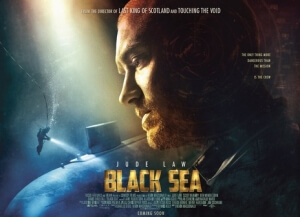 The newest addition to this line of films, director Kevin Macdonald’s Black Sea, not only compliments all that came before it but also gives us an intriguing and adult plot drive to keep us hooked all throughout. It sets up a timely dilemma for most of our main characters, including a Scottish accent pretending to be Jude Law (seriously, it sounds odd coming from his British vocal chords), who at the beginning of the film we see being made redundant. He and a rag-tag group of layoffs soon come together on a covert mission to recover some sunken treasure, albeit with a company presence (Scoot McNairy) by their side, to ensure their individual retirement funds are in the millions. There’s a very capitalist theme lying underneath the surface, with a group of working-class citizens finding riches initially meant for the wealthy and better-off, a class that McNairy’s character represents. Like any rich-or-poor situation, the proletariat is constantly pressured to rebel and rise up against the bourgeois. However, as Russian history has taught us, things can so easily go from bad to worse, and without giving a clear indication as to what the outcome is (though it’s likely you’ll guess it before the running time is up) there’s a hint of truth to that. Writer Dennis Kelly hooks us on to this voyage with these harbouring themes of greed and class, and how they serve to either undo or evolve a character when either issue becomes too extreme for them to handle. The promise that every crew member gets an equal share of the treasure almost immediately has the characters questioning how long it will take for each person is axed off so that the last man standing gets the lot, as though Kelly is mocking the expected tropes through his writing right from the word “go”. Its constant playing with expectations is what makes the rest of the film so intriguing. For example, you’d think almost instantly that Ben Mendelsohn’s unhinged character (unsubtly named a “psychopath” when we are first introduced to him) would suddenly go savage and start killing everyone, and it starts to seem it’s going that way but the indication suddenly disappears after a halting incident and doesn’t reappear until much later on. Even when things start to predictably go pear-shaped during the third act, you’re still hooked on how it’s all going to transpire and to whom, and it’s a combination of Kelly’s writing and Macdonald’s tense approach to the filmmaking that glues everything together. You can definitely detect certain influences in Macdonald’s style and portrayal of Kelly’s script, from The Treasure Of The Sierra Madre and There Will Be Blood in its exploration of the corruption and greed of the human soul, to even films more outside the box like Alien (a prolonged diver’s voyage on the seabed certainly resembles how the crew of the Nostromo chartered that alien planet in the opening). Though Black Sea is a tad too conventional to stand proudly against John Huston’s classic film or even any of the others, if anything you can definitely admire its ambition to compliment and pay homage to them even if it’s unintentional. Though of course, there are some of the usual tropes laying about just waiting to be used. Of course there’s a claustrophobic on board a submarine (though they never really do anything with that, come to think of it); and obviously one or more of the characters has family waiting for them back at home which, in films like this, is usually a death sentence in waiting. Some of the characters, particularly the ones we’re going to knowingly label “red shirts”, are hardly developed or just background fodder, and notable elements such as a blurry-visioned flashback to happier times with Law and ex-wife Jodie Whittaker are a bit too cheesy to be associated with this sort of film. It’s imperfect, but it’s the tension and the unpredictable nature that really sets Black Sea’s sails against the wind, and makes for a highly entertaining thriller that will leave you excited even at so many miles under the sea. Black Sea thrives in its tension, build-up and variable plotting which, despite some of the usual clichés, makes this a very intriguing and entertaining study of the ongoing battle between two polar-opposite classes.